Professors Richard Ng, Michael Freedman & Zhenghan Wang (Microsoft Station Q, UC Santa Barbara), Eric Rowell (Texas A&M) and Xiao-Gang Wen (Physics, MIT) were awarded a $1.3 Million collaborative NSF-Focused Research Group Grant on "Mathematical Foundations of Topological Quantum Computation and its Applications". The research will cover the mathematical, physical, and computational aspects of topological quantum computation. Michael Freedman was awarded a MacArthur Fellowship in 1984, a Fields Medal in 1986, and he is a member of the National Academy of Sciences. He founded the research group Microsoft Station Q - Santa Barbara. 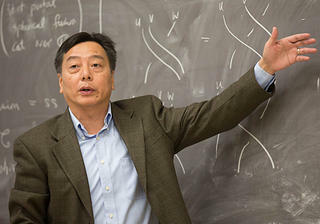 Richard Ng joined the LSU math department in 2013.